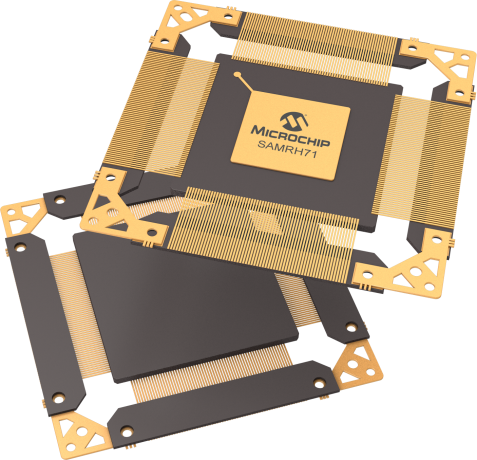 SAMRH71 is the Radiation-Hardened-By-Design (RHBD) version of the popular Microchip SAMV71: a highly integrated, high-performance 32-bit ARM-embedded micro-controller based on the Cortex-M7 architecture. This space-qualified version of the product adds SpaceWire and 1553, and also offers: ceramic & hermetic package, extended temperature range -55C to 125C, extended qualification according to QML-V or QML-Q space grade flow. Radiation performance for the SAMRH71: SEL LET > 62 MeV.cm2/mg (at 125C), SEU > 20 MeV.cm2/mg, and TID up to 100 Krad (Si). Engineering samples are currently available with ordering code SAMRH71F20B-7GB-E, and the evaluation kit is available with ordering code SAMRH71F20-EK.